The Ottevanger Hammer Mills 670 series are very efficient mills and the result of our innovation and many years of experience. Depending on the number of revolutions and selected sieve size the machine is able to reduce the particle size down to approx. 200 micron. 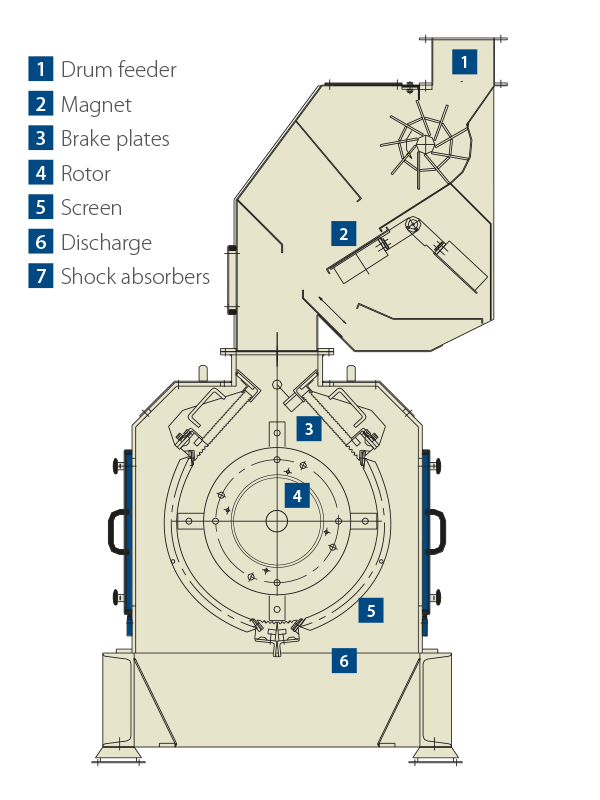 The Hammer Mill 670 machines can rotate in two directions and are equipped with electro-pneumatically operated valves and cast iron rupture discs. The Hammer Mills 670 series are very efficient mills and the result of our innovation and many years of experience. features a solid all-welded construction and has a number of benefits, which are mentioned below. A closed vibratory feeder with a permanent magnet ensures the supply for the Hammer Mill. The feeder can be provided with a roll-feeder with a stone cather and a self-cleaning magnet. One of the options is to add an automatic frequency-controlled vibratory feeder to the machine. The feeder ensures a uniform distribution of granulate over the full width of the grinding chamber. The milled material leaves the grinding chamber immediately in order to keep the efficiency of the milling process as high as possible. Would you like to receive more information about our Hammer Mills 670?